In 2005's The Works, Kate Ascher presented the "Anatomy of a City" through an abundance of explanatory diagrams, details, and other illustrations alongside her thorough yet readable text. 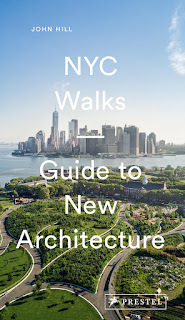 The book described how something as complex as a city actually works by dissecting one in particular: New York City. 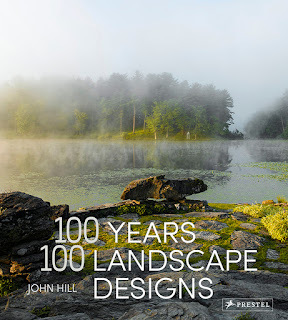 It is an exceptional book for being both educational and beautiful, a combination that makes the information understandable for a general audience. 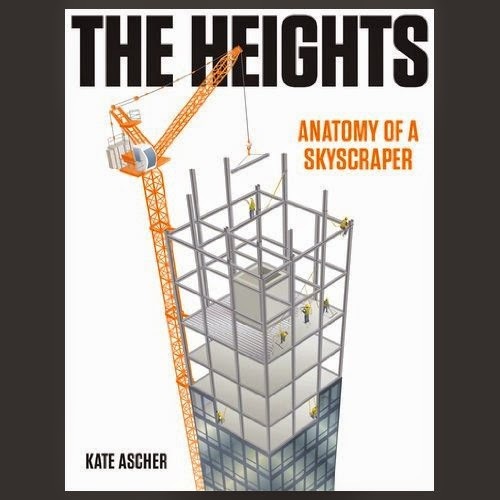 Her follow-up, The Heights, follows the formula of its predecessor, and it can be seen to pick up where the infrastructure of the city leaves off: at its buildings, specifically skyscrapers. While The Works used a specific metropolis to discuss cities in general, The Heights inverts that and presents general information so readers can understand what skyscrapers as a typology have in common. 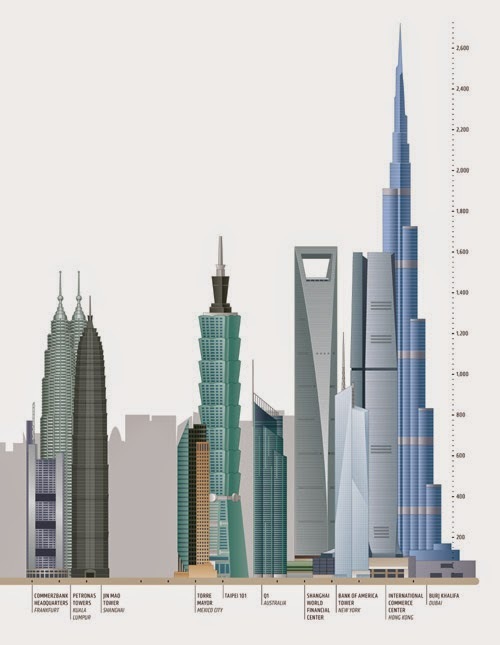 So Ascher does not dissect just the Burj Khalifa (far right in the above diagram), for example, as a case study in skyscrapers. By describing the systems, components, and other considerations that go into the design and construction of tall buildings, the idiosyncrasies of a single skyscraper can be either set aside or touched upon in a sidebar. This approach is helpful, for it enables the book to be structured via these various pieces (structure, construction, elevators, sustainability, etc. ), and it results in a broader understanding of what it takes to build tall; or even to build in general, such is the extensive range of the information. 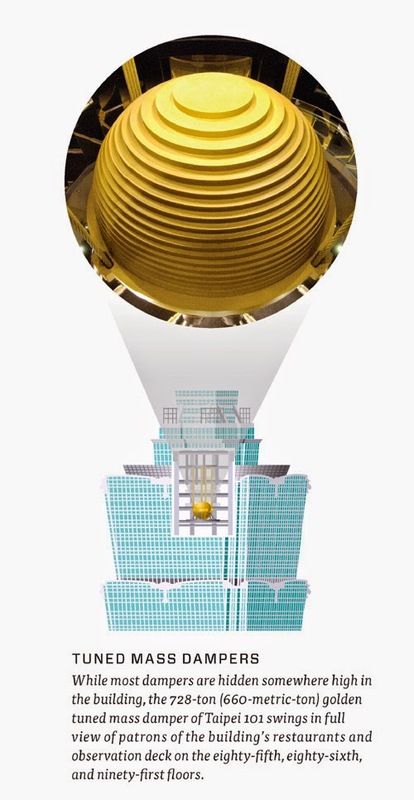 Of course some aspects of design and construction, liked tuned mass dampers (below), are so specific to tall buildings that some architects have exploited them in their designs, and Ascher has presented them as such. Ascher closes the book with a chapter on the future, which looks at building taller, greener, more sculpturally, and as cities within cities. Like anything this future is partially written by what has already happened, be it from decades ago (Chicago's John Hancock Tower is an example of a city within a city from the 1970s) or even millennia. Yes, millennia. Ascher presents a couple projects that imagine pyramid-like forms for building taller and taller for more and more people. The inclusion of these projects ultimately brings into question the defining characteristics of skyscrapers, namely the height-to-width ratio. Is it just about pushing humanity further and further up, regardless of form? Whatever the case may be, these pyramidal designs are so big and populous, they are such a strong break from the prevailing skyscraper typology, that a lot of what Ascher presents would need to be reconsidered. They would more literally become cities within cities, or to put it another way, they would synthesize The Works and The Heights.